Some advertisements of the book. I was given this book by my pastor. It was a short read, about 70 pages. But within these pages I could discover that this world is not ready to accept just one way to turn to Jesus. There are people from other cultures and other world views, who are ready to hear the Gospel from a whole different approach than we are used to giving it. The author present three types of people and three type of cultures. They are the guilt, shame and fear based cultures. I am not going to get into a summation of how the author breaks down each of these people groups. But I will say that people in the western culture are in the guilt group; people in the Asian cultures after in the shame group; and people in the indigenous cultures are in the fear based cultures. Being in the western culture we are apt to say that anyone who wants to come to Christ, must agree that they are sinners and that their sin makes them deserving of death and hell. But Jesus came into this world and paid the price for our sins. Anyone who accepts this by faith is forgiven and becomes a child of God. They are forgiven and they have eternal life in the kingdom of God. That is the basic story line. We may try to help people recite the sinners prayer, bow their head and invite Jesus into their hearts. We want to try this approach on everyone. We may think that if anyone does not come to Jesus, seeking to accept him as the atoning sacrifice for their sins, then they are not coming to Jesus in the right way. But this book teaches me that there are other ways to approach people with the Gospel message. They can approach them with a message that is receptive to those living in shame based cultures. There is a Gospel approach that would appeal to those living in fear based cultures. All of these different approaches are clearly supported by Scriptures. The author uses the first few chapters in Genesis to bring out his point. And when you follow his thesis closely he is clearly right. I came to think about my own conversion to Christianity. I was not a man who cared about sin and the law and justice. I was a hedonistic person, caring about having a good time. I was not seeking an atoning sacrifice for my sins, nor did I want to talk about my need for a savior. I did not care about sin. But I did care about who I was becoming in the world. My hedonistic life style meant that I did not study well. I felt like failure in so many ways. I knew that I was being left behind in the dust of life. In my heart of hearts, shame was an issue for me as well as lack of honor and position in society. That is what I cared more about more than the truth. God knew my need and he sent me Christians who were from a shame based culture, the Korean culture. Korean missionaries invited me to Bible study. They did not make me say a sinner’s prayer. I never knew what that was. They never made me understand a quick Gospel presentation, convincing me of my guilt and how Jesus fulfills the law. They talked about that, but I was not listening. For me, that understanding came later. They treated me as a lost person from a shame based culture. They invited me into fellowship with them. I ate suppers in their homes. I was invited to conferences. I was invited to speak in front of the church. On my first day at church, I was invited to the front of the church and introduce myself with my long hair, cowboy boots and beer tee shirt. I played soccer with the students and the missionaries and people sincerely cheered me on. I was treated with respect and given positions in the ministry. According the author, what the missionaries were doing was elevating my sense of honor before God and people, which is a way to minister the Gospel in shame based cultures. The Korean missionaries approach worked. I studied the Bible. I became part of the church. I was loved and accepted. One month after I began Bible study, I attended a Bible conference. I studied about 3 people out of John’s Gospel, the Samaritan Woman, Nicodemus, the Lame Man by the pool. All of them had serious life problems. All of them had their special shame issues. I was amazed that Jesus came to each of them and gave wise words of counsel. He elevated them out of their shame, forgiving them and giving them new lives and eternal life. I was amazed. The Holy Spirit helped me to see that the words of God in the Bible were very deep. Jesus is who he says he is, the Messiah. I became aware of the Kingdom of God and knew that Jesus is the Way. I wanted to be a Christian and follow Christ. I was literally born again that day in 1986 at the age of 22 and have been following Jesus ever since. If you noticed, at the time of my conversion, I never stated that my first revelation about God was that I was a sinner and that I realized that Jesus died on the cross of my sins. No. That was not my first revelation. All of that came soon afterwards as the Gospel took shape in my life. I can now define what happened to me over the years. I had an awkward time explaining my conversion to people. All of the people around me are from the western, guilt culture. They are expecting me to say that I came to realize I was as a sinner and that Jesus died and rose for me. I never started with that. I started with the story I already stated. Maybe some people throught I was not authentic. That is their problem, because I was truly born again by the Spirit of God. And God used Korean missionaries, from a shame based culture, treating me like a lost soul from a shame based to culture, to help me to come to Jesus. God knew what I needed. The legal approach is not what I needed at that time. I needed people to elevate my sense of honor and position in the eyes of man and God for a while, until I met Jesus personally. There is more than one way. Some people, who think that the Gospel must be presented in one single way, call this type of ministry approach “suspicious”. They may claim that the missionaries are “love bombing”. But they are not doing something suspicious. They are actually attempting to minister the Gospel in a way that they developed in a shame based culture, the Korean culture. Was it wrong? No. It was different. Westerners are not used to it. Should they have done this method in a guilt based culture? Some people needed such an approach, like me. God provides what we need to accept Jesus. Some people say, “The ministry attracts a certain type of person.” I would say so, yes. It attracts hedonists like me. It attracts people that are burdened by the shame caused by sin and not so much the guilt caused by sin. God does work. God sent the missionaries to me with the approach I needed to accept Jesus as my Lord and Savior. I don’t even think that the missionaries knew that they were doing this. They never defined it. I never defined it. I couldn’t. It just happened. I was living in it, living in a Gospel ministry born out of shame based culture. I wish I knew what was happening. But this book defines it for me. I am happy because I can finally clearly define what happened to me over 26 years, thanks to this book. This book teaches me that I can not approach people with prejudice, thinking, “OK, you are white and from the USA, therefore I will approach you as if you are from a guilt based culture.” Nor should I think that all first Nation people are from fear based cultures and therefore there is one approach. No. I am a Canadian/American Caucasian middle class male. But it was the Korean missionaries’ Gospel ministry approach, born out of a guilt based culture, which created an environment for me to believe in Jesus. Each person is different. But it is good to know that the Bible provides the tools for more than one approach. This book teaches me that I need to increase the tools in my Gospel ministry tool box. I can not just try to present the guilt culture Gospel message over and over again. The Bible does not even do this. I can not be one D, or even 2-D. I need to be a 3-D Gospel minister. 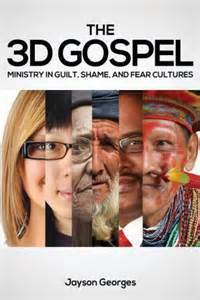 All Christians engaged in ministry must be trained in cross cultural ministry to preach a 3-D Gospel. The book explains why people in the ministry shy away from discussing things openly with each other. Some Korean missionaries have been criticized for not talking about issues that come up while doing ministry. Look at pages 20-24 if you read the book. It is not a diabolical as people make it out to be. It is simply people born and raised in a shame based culture doing life together as they know it. And so that next time you see a middle class, hedonistic, unbelieving, American male, don’t assume he needs to make a sinner’s prayer and confess that he is a sinner who needs Jesus. Maybe he needs to be invited to dinner and invited to the church and cheered on at soccer games to elevate his sense of honor before man and God and taught the Gospel at the same time.